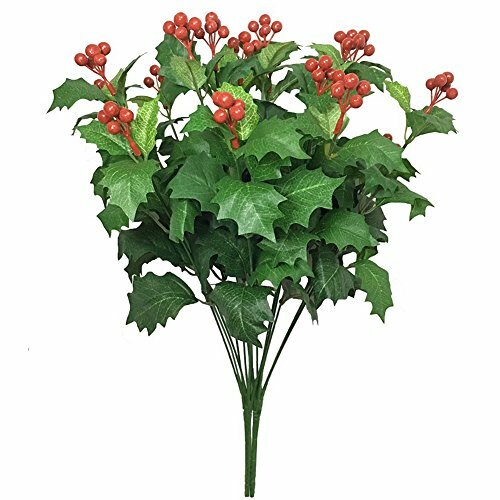 This RED BERRY GARLAND will add a pop of color to your Christmas and wintertime decorations. The bright red color is perfect for your holiday seasonal decorating! Styrofoam round berries are dipped and covered with a shiny lacquer red coating. These berries are each fastened to a wire stem and connected to a hand wrapped wire core garland. The wire core allows the garland to twist, bend or form into a variety of shapes. You can also snip off individual berries or sections of the garland and use them in creating wreaths, flower arrangements of Christmas craft projects. 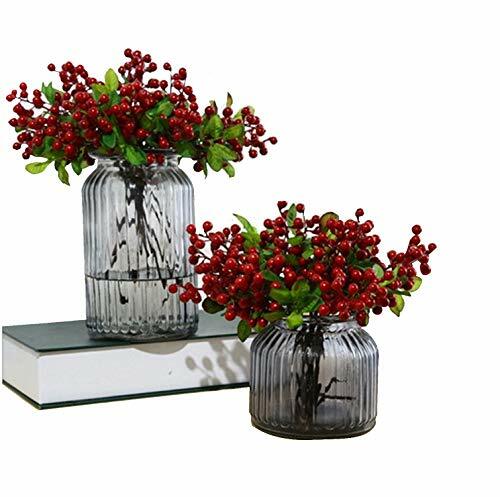 Specifications: Material: foam ball, iron wire Berry diameter: 10 mm/ 3.94 inch Total length: 25 cm/ 9.85 inch Color: red Package content: 6 x artificial berries stemsNote:goods do not include vases.It takes about 15pcs berries to achieve the effect in the picture. 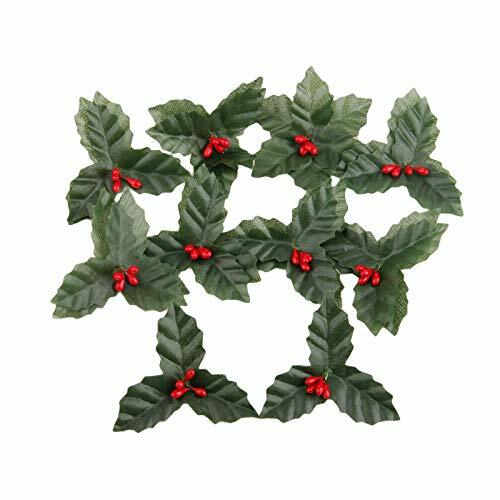 Package List: 50 x Dark Red Artificial Holly Berries 50 x Green Artifical Leaves Note: Quantity error between 1-3pcs. Note: NO Retail Box. Packed Safely in Bubble Bag. 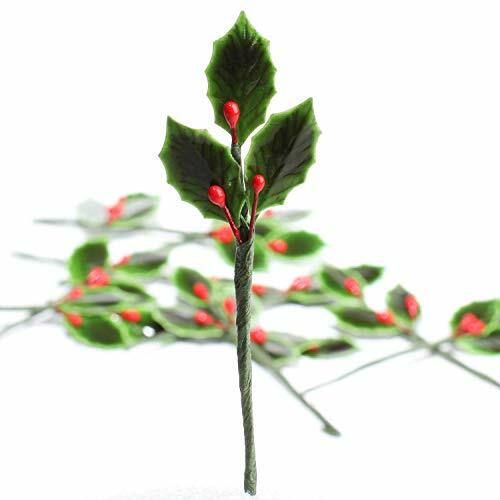 Quantity: Package includes 50 Stems Cute Mini lacquered holly leaves with red berries.Sweet little holly picks, each with 3 lacquered leaves and 3 red berries,with paper covered wire stems. 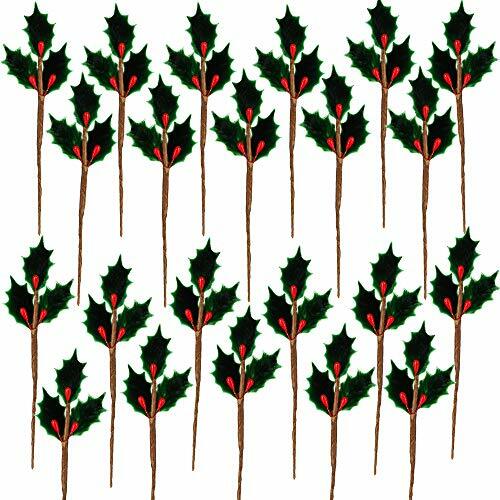 Dimensions(inch)(LxW): Each Mini Lacquered Holly Leave Pick is appr.4.4 x1.7. Material&Color They are plastic, rigid, with a glossy ,hard lacquer coating. They have elongated red berries on them. They are on wired stems. The stems are wrapped in brown floral paper that you can easily twist, bend, and shape. Seasonal Embellishment Perfect for embellish wreaths, garlands, candle rings,corsage or boutonniere for a winter wedding or holiday party.Perfect for embellish ornaments,cards,gifts and more decorating or crafting. It is a great way to adorn teensy doorways, trees, signs, and more in fairy gardens, dollhouses, and other holiday scenes! 200 Counting Artificial Red Holly Berry Picks Stems Fake Winter Christmas Berries Decor For DIY Garland And Holiday Wreath Ornaments by Shxstore PRODUCT SPECIFICATIONS DESCRIPTION: Type: artificial flowers stamens Shape: berry Quantity: 200 counts Color: red Material: foam ball and floral stem wire RED BERRIES PICKS STEMS SIZE: Red Berries Diameter: 10 mm and 12 mm Floral Stem Wire Length: 2 inches (5 cm) PRODUCT USAGE DESCRIPTION: The red berries are perfect for DIY arts crafts project. You can DIY red berry wreath, red berry garland, red berry branches, Christmas wreaths, rustic wreath or other handcrafts with these cute berries. They also can be used as photography props or sketch props, and they are perfect photo scene setting or stage decorations. 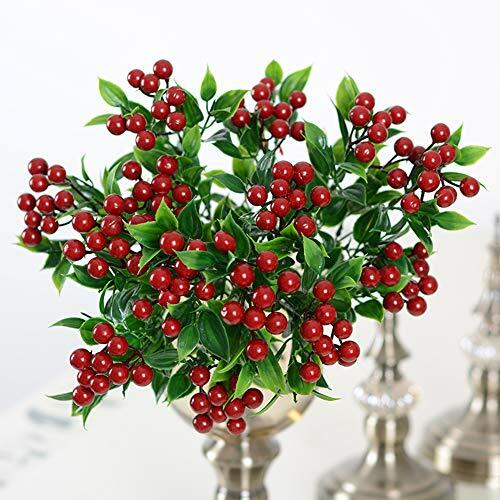 Red holly berry is beautiful prop for Christmas decorations, arts and crafts DIY, cake toppers, wedding favor, photo props, and various occasions required. 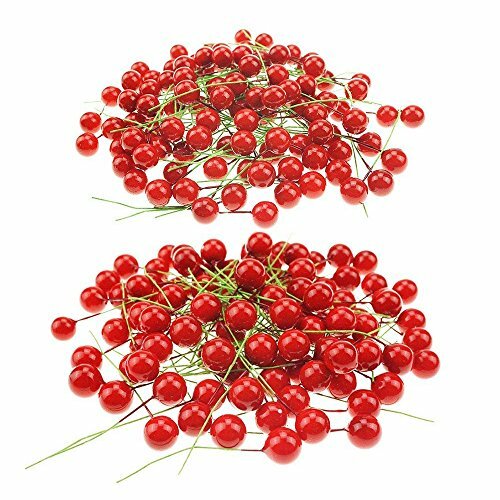 Red berry suitable for decoration Christmas garland, berry wreath, berry Christmas tree and berry Christmas ornament, etc. CHOCKING HAZARD:The red berries are small parts. Not for children under 3 years, children should use it under adult's supervision. 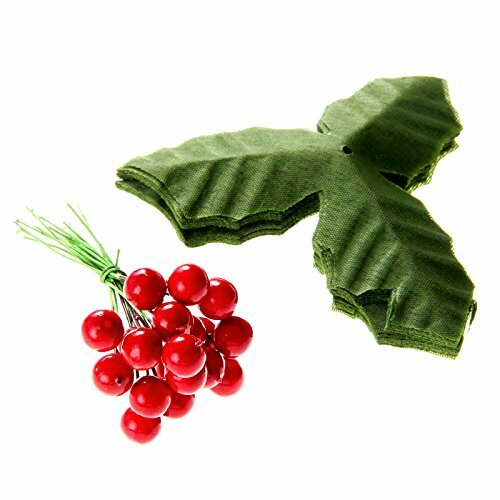 Package list: 10 pcs x Artifical Berries and Leaves Note: 1.Please allow 1-5mm error due to manual measurement. 2.The color may have different as the difference display, pls understand. Pair of Libbey Holly and Berries Water or Wine Goblets, 7" Tall, Excellent Cond. Holly and Berries #2 Christmas Sizzix Originals Medium Die 656725 NEW!